Youth Sports Safety Resources: How do we keep young athletes safe from sexual predators? 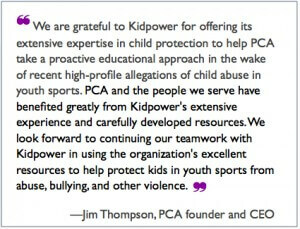 — Jim Thompson, PCA Founder and CEO. Video Series: Protecting Young Athletes from Sexual Abuse (Key Actions for Parents, Coaches & Leaders). View online or download these videos and use them to help start the season with a clear safety plan for keeping kids on your teams safe! Mark Murphy, President and CEO of the Green Bay Packers, starts off this 90 second Trailer of our new video series, Protecting Youth Athletes from Sexual Abuse: Key Actions for Parents, Coaches and Youth Sports Leaders.